Eve, do you miss doing the single episode stories? EM: No, I don’t. We were fortunate from the second series to get, I think, 6,7,8 which was Burn Gorman’s story which was him being dead and broken and trying to live a real life. I found it fascinating that we were able to stretch a story over three episodes instead of it being a beginning, middle and end in 40 minutes. As an actor it gives you more and you can just invest more in it more and enjoy it more. I feel it’s more of an adult theme and that’s more where we want to be with ‘Torchwood’. Russell wanted ‘Miracle Day’ to be made from day one but never had the facilities and the amenities to make it. KO: He always had that story in mind. Which episodes stood out for you? AT: I loved the first one, I watched it four times and my heart was always racing – and I knew what was going to happen. KO: I thoroughly enjoyed this series more than most of the others ones in the past, really. I like the one where it went back in time. KO: I really did like that episode an awful lot. And I thought 10, the climax was amazing. But episode 7, where Jack went back and met Angelo, I thought they really nailed it. AH: They did a really great job with the period and everything. Considering how ‘Torchwood’ kills off characters, have you ever felt safe? KO: Me? Rhys is the most killable character of the whole lot! They don’t kill me because it works so well. Rhys is a very killable character. I’m constantly on edge going: ‘this is the end’. KO: And no one’s safe and I feel myself very, very blessed. EM: I’m waiting for the chop. AH: You know that when coming on, you know. But we’re in good company. EM: That’s what happens in ‘Torchwood’, it’s a deadly organisation. KO: I think the audience got the shock of its life when both Arlene and Alexa died. They just did phenomenal work on the whole series. My mates were stunned at what happened. The way Dr. Juarez went was just oh my god! AT: That was just so fun to shoot though! 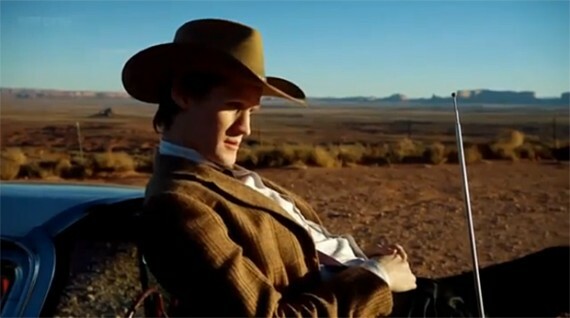 In 2013 ‘Doctor Who’ will be celebrating its 50th anniversary, will ‘Torchwood’ be playing a part in it? EM: I wouldn’t have thought so. 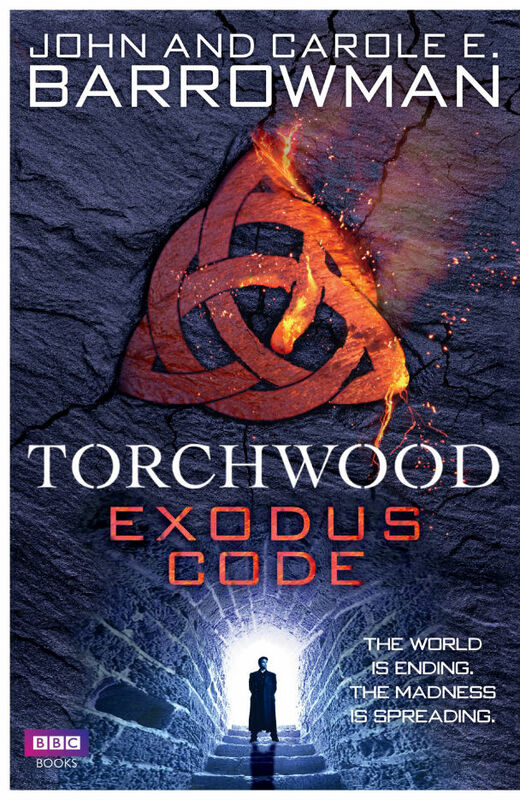 We have lots of adult themes running in ‘Torchwood’ and I think it would be inappropriate for us to have anything to do with ‘Doctor Who’ because it’s predominantly a family programme. I think that where ‘Torchwood’ is, it deals with darker subjects and I think inter-mixing them, if they want to do that, then fine but I can tell you that I’m not involved in it – they won’t give me guns or a bazooka. KO: Who knows? It would be different. It might come back as a special. EM: I think the next step would be a movie. We change every year. We have to change every year to keep it fresh and different and keep people interested because by the third, fourth, fifth series of ‘Lost’, ‘Sopranos’ however good they are, they’re extraordinary, but you know what you’re going to get. With ‘Torchwood’ we can live up to the name that you never know what you’re going to get. KO: They can do whatever they want with the show. As Captain Jack has already appeared on several episodes of Doctor Who I see no reason to have him, and possible Gwen, appear on the anniversary show. They could appear without bringing in the darker, or sexier, aspects of Torchwood which are inappropriate for Doctor Who. John Barrowman has already indicated his willingness to return to Doctor Who in the future. 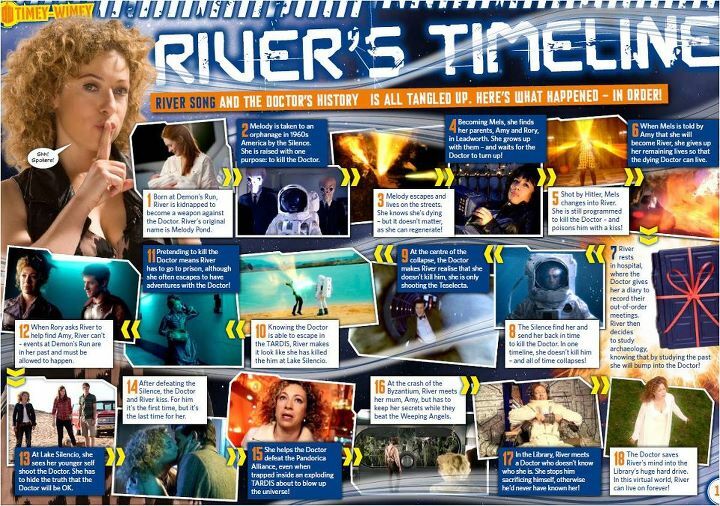 Another version of River Song’s Timeline can be seen in the picture above–click on it to make it larger. BBC Worldwide have announced the first official Doctor Who convention to be staged since the series return in 2005. Billed as the “Ultimate Doctor Who Fan Event”, it will feature guests Matt Smith and Steven Moffat, plus many others from the cast and crew including Danny Hargreaves (special effects supervisor), Michael Pickwoad (production designer), Marcus Wilson (producer) and the team behind Millennium FX. It’s brilliant that the first official convention is being held in Cardiff, the home of Doctor Who. I’m really looking forward to seeing the fans there, and remember – bow ties are cool! Robert Hewitt Wolfe is developing a new show for SyFy. The premise: “After decades of war, the newly formed Unity Democracy orders a volatile mix of humans and trans-humans to lead the Starship Defender on an expedition in search of lost worlds requiring law and order.” It sounds a lot like Andromeda, which Wolfe had worked on. Hopefully in terms of quality the show is closer to Star Trek: Deep Space Nine, which Wolfe had also worked on. Emilie de Ravin, who played Claire on Lost, will become Belle on Once Upon A Time. Reportedly she has some connection to Rumplestiltskin, who does seem to be at the center of things in both worlds. I wonder if both worlds will also have a version of the Beast. The Fringe Division remains puzzled about Peter Bishop, but at least he has been moved from a cell to Walter’s house which had been sitting empty as the Walter in this timeline is afraid to leave his lab. There is still a guard stationed outside the door. Olivia has caught on that there was something going on between Peter and the Olivia of his timeline. So far Olivia’s desire is for Peter to be able to get back to her. Perhaps that will change over time as some of the interviews I’ve seen suggest that the show will continue in the current timeline for a long time. Above is an interview with Anna Torv. Earlier in the season, Community did a parody of Doctor Who entitled Inspector Spacetime, which was claimed to be a British science fiction show which started in 1962, one year before the real Doctor Who started. If anyone is still trying to figure out the timeline for the relationship between River Song and the Doctor, BBC America has put out a helpful (but confusing) chart. Bernard Cribbins has received an OBE (Order of the British Empire) medal for his contributions to drama. 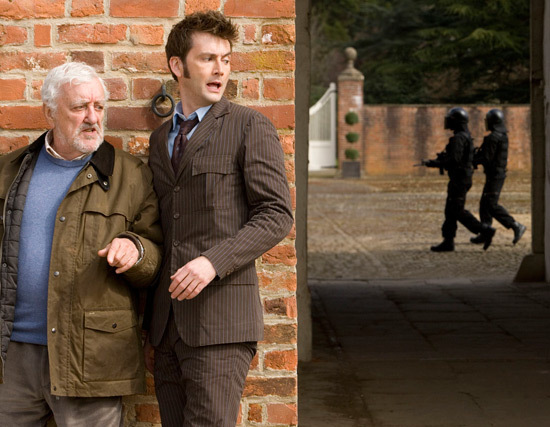 His roles include Wilfred Mott on Doctor Who in recent years. He also had a role in in the 1966 Doctor Who movie, Daleks Invasion Earth: 2150 A.D.
Peter Bishop won’t have the reunion he was hoping for. His lady love, Olivia, doesn’t remember him, so his reappearance has no effect on her life. Anna Torv, who plays Agent Dunham, revealed, “He’s never existed and doesn’t exist in this universe. He’s the one entering this world … whereas Walter and Olivia and Astrid have made do. This is how we’ve always known [life] to be.” Can you say odd man out? With the timeline change, certain events have been put on the back burner or erased completely. For example: Whatever happened to baby Henry? The child of Alt-Olivia and Peter just wasn’t meant to be. Torv says, “There’s no possible way that Henry could happen in this timeline, because Altlivia never met Peter.” We knew that would happen, but part of us still wondered if he had a shot. As for Walter, he won’t embrace Peter with open arms. It might take a whole season (or more) for the duo to return to normal. Walter’s portrayer, John Noble, claims the pair’s relationship “might” get back on track “if Walter acknowledges this is his son from a different dimension,” which sounds like a tough pill to swallow. Considering the amount of time Walter’s spent mourning his death, we don’t expect him and Peter to become a big, happy family overnight. Leonard Nimoy returns to Fringe tonight. Does that mean the end of Anna Torv playing Nimoy’s William Bell? Update: It sure was disappointing that Nimoy only appeared in an animated segment. Apparently his return from retirement is limited to voice roles. As for the question above, it does appear to be the end of William Bell. 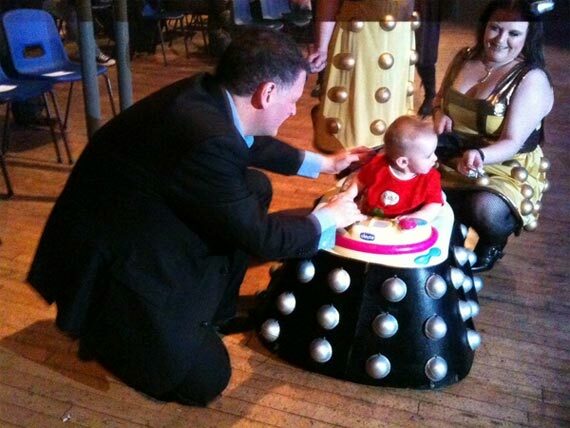 In other Doctor Who news, a fan is suing the BBC claiming he first came up with the character of Davros for a competition at age 13. 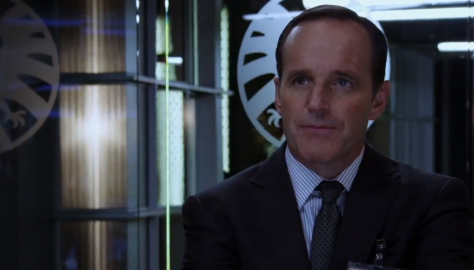 Bell’s most unexpected and equally unorthodox “return” promises to have a significant impact on the “machine” storyline that has Peter fretting over his fate as well as that of this universe. 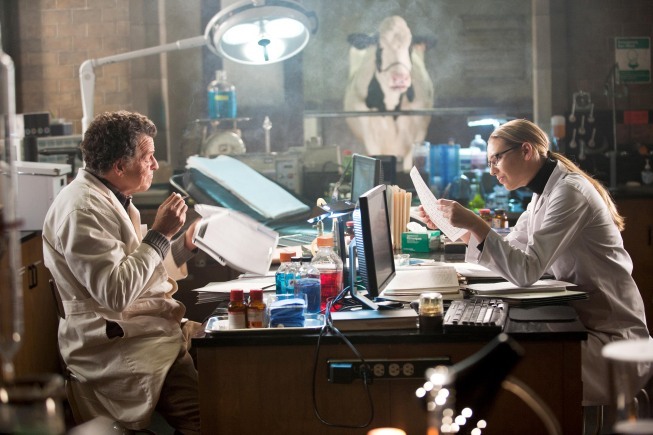 As Torv notes, the late genius “has a lot of information that we don’t have, so he’s an awesome resource for the team. 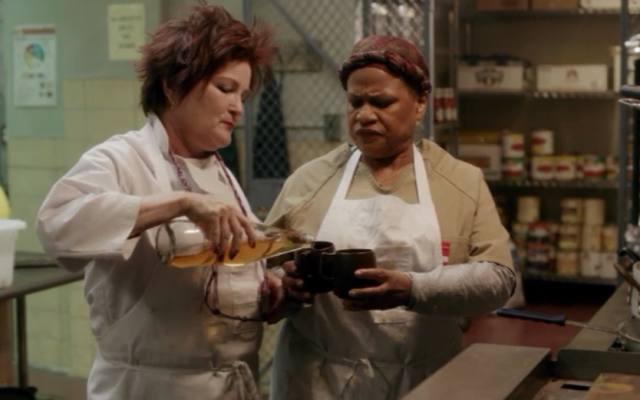 And for Walter to have someone to work with is another [advantage].” Or could it be a liability…? The episode was also significant for first showing this universe’s version of Lincoln Lee. There are also plans to add a new female FBI agent. Next week returns to the alternate universe, and the hotter version of Olivia. The first picture of Adrianne Palicki as Wonder Woman has been released. Another Friday Night Lights star, Minka Kelly, is seen below, with costars Annie Ilonzeh and Rachael Taylor, in the remake or Charlie’s Angels. That choice, to end V with a cliffhanger despite being very much on the bubble for a renewal, was made back in October. 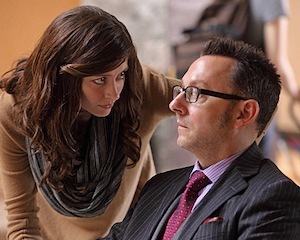 In the middle of production, ABC told Rosenbaum that the show’s order was being reduced to 10 episodes, leaving the writer-producer with little time to figure out how to finish up Season 2. The result, Mother’s Day, features several character deaths and a guest appearance by Marc Singer, who starred in the 1980s original V mini-series. 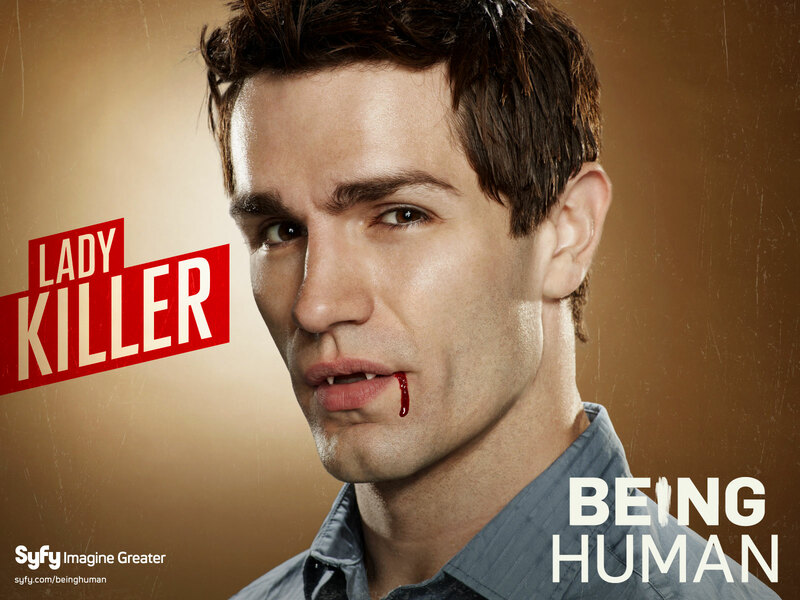 Syfy has renewed Being Human (US version) for a second season and the BBC has renewed Being Human for a fourth season. I haven’t watched either version yet. Anyone have any comments as to whether they are worth watching, and if so which is better? On Fringe, Olivia expressed the belief that she had difficulty competing with Fauxlivia due to being less fun after having been experimented upon as a child. 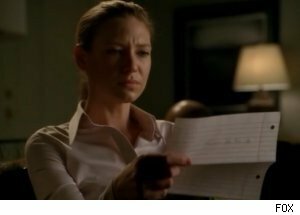 While Fauxlivia definitely is the hotter of Anna Torv’s characters, Olivia needs to understand that the real problem is that she has been pushing Peter away. I had even been rooting at times for Peter to get back with Fauxlivia, until we learned in this week’s episode that possibly only one universe will survive and it will be the one with the version of Oliva which Peter chooses. Actually I suspect the show will end up with both universes surviving, but it now does sound far too risky to root for Fauxlivia, regardless of how much hotter she is than Olivia. A major component of the episode involved an excuse to bring in someone who could read minds so that they could read Peter’s thoughts. This led to the scene in the picture above where Olivia read that Peter still had feelings for Fauxlivia. The mind reader might have been more helpful if he also pointed out that Peter clearly also has feelings for Olivia. Strange that Fringe, which is probably the top American science fiction show now on the air, has essentially turned into a gigantic love triangle. 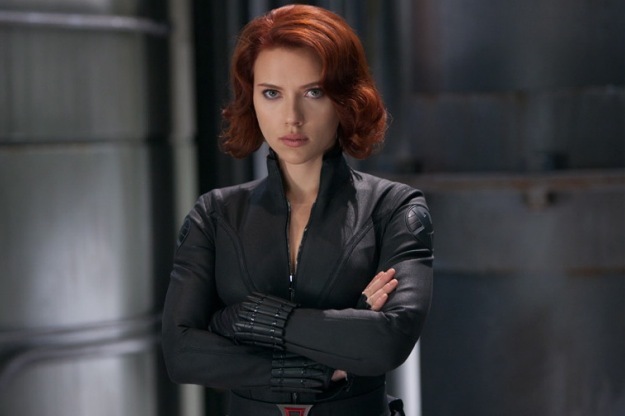 In an interview with Jimmy Fallon, Samuel L. Jackson revealed that there would be a female side kick for Nick Fury in the upcoming Joss Whedon Avengers movie. 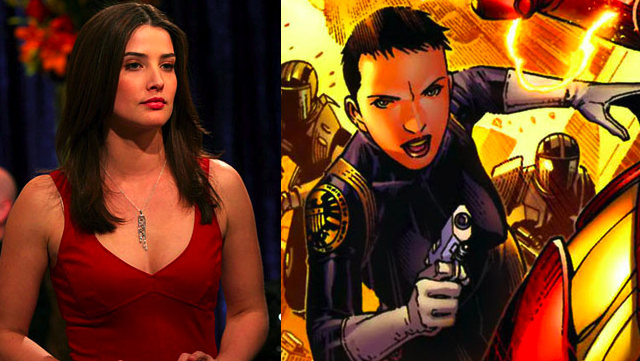 The latest rumor is that Cobie Smulders of How I Met Your Mother is the front runner for the role of SHIELD Agent Maria Hill. Olivia Wilde is rumored to be in consideration to play Lois Lane in the Superman reboot. Christopher Nolan and Aaron Sorkin won major awards last night at the Writers Guild Awards. Christopher Nolan won for best original screenplay with Inception and Aaron Sorkin won for best adapted screenplay with The Social Network. Sorkin is currently working on a pilot for HBO which goes behind the scenes of a cable news show. Sorkin has shown interest in this type of show in Sports Night and Studio 60 On The Sunset Strip. Going to a cable news show would allow him to include the type of politically-oriented stories he wrote for The West Wing which didn’t work as well when mixed into Studio 60. Although it is far from certain that V will return next season, the season will reportedly end on a cliffhanger. This could turn out to be like the original series, which ended on a cliffhanger. By that time the series had gotten so bad that nobody really cared. The Cape also appears in trouble of not coming back, being reduced to only ten episodes. The return of The Event is being postponed until after The Cape concludes its brief run. 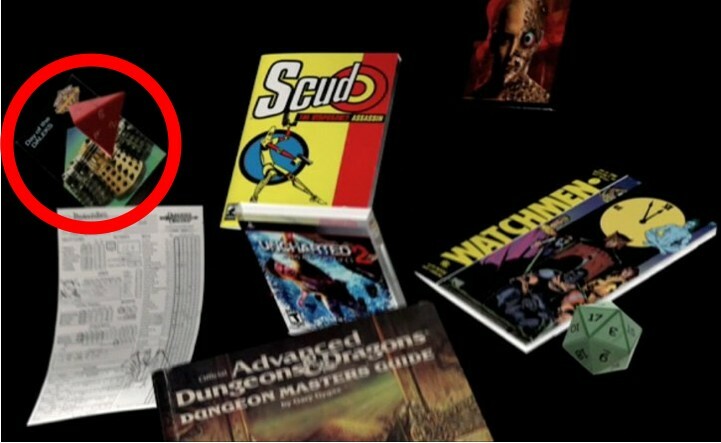 Community had another great genre-oriented episode involving a game of Dungeons and Dragons. The episode even included a shot with a picture of a Dalek on the table. Ironically, this occurred the same week on which Jim Parsons, whose show The Big Bang Theory is on opposite Community, admitted in an interview with Craig Ferguson that he doesn’t watch Doctor Who (video above). Last week I had a video of kids and Daleks. 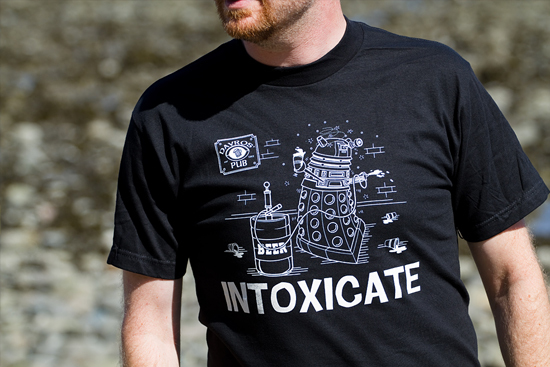 It appears that Steven Moffat is looking into this trend. Here’s a must buy item. The Doctor Who Site reports that this Tardis mug is available for pre-order. For unexplained reasons it is available in the United States and Australia but not the U.K.
Its the deepest part of winter, the exact midpoint, Christmas Eve – halfway out of the dark. Amy and Rory are trapped on a stricken space liner that’s plummeting through banks of thick icy fog to the surface of the planet below. The Doctor’s only chance of rescuing the ship’s four thousand passengers is to save Kazran’s soul and show him that life is worth living. For this he needs to go back, way back, to when Kazran was a boy with a life full of promise. But can the Doctor put a song in Kazran’s heart and love in his life, in time for Christmas? Can he bring him out of the dark? 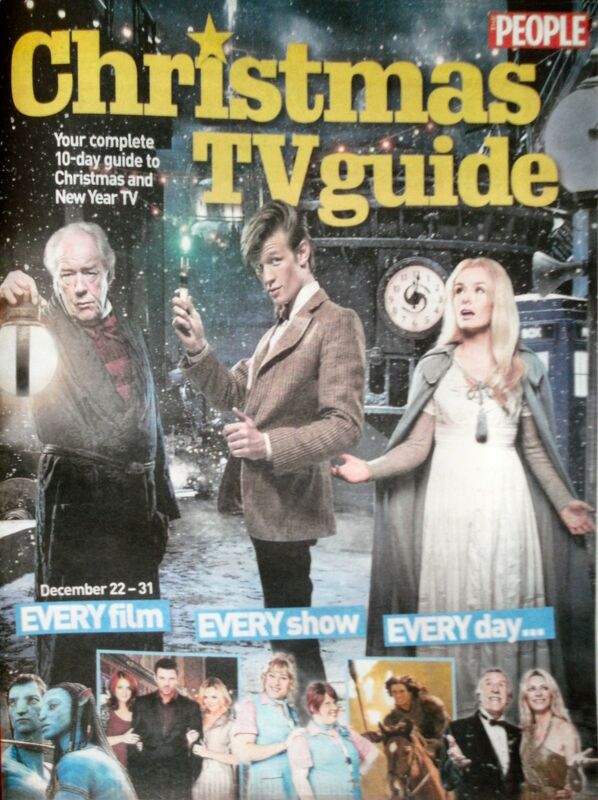 More information from the BBC on the special here and more on Matt Smith and Karen Gillan celebrating Christmas here. Unlike previous years when markets outside of the UK had to wait, the Christmas special will air in the United States and some other countries on Christmas Day. It will also be released on DVD and Blu-ray on January 24th 2011. The Independent had a recent interview with Karen Gillan (Amy Pond). On Fringe, although Peter was oblivious to all the clues that Olivia was not the Olivia from our universe (or as Walter put it, “He fell right into her vagenda”) the call on Peter’s Droid (how much did they pay for that product placement) finally got Peter to get out of bed a couple of hours later and check out Fauxlivia’s Mac (yet more product placement). I imagine that a call that someone saw Olivia appear with a message and then disappear was more jarring than finding the woman you’re in bed with has no idea about what happens in Casablanca. The episode got both Olivias (Anna Torv) back to their own universe. 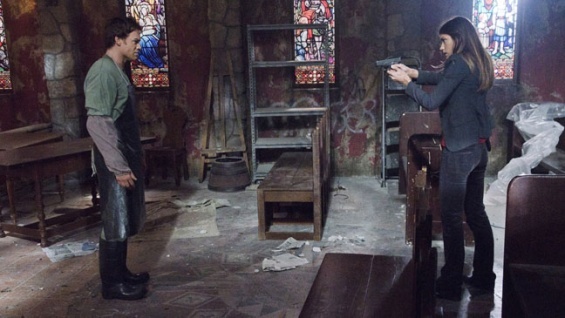 The episode was great payback for those who have followed the series, including aspects such as the typewriter which is used to communicate with the other universe and a fantastic scene where Peter realizes that the woman who Fauxlivia is holding at gunpoint is a shape shifter. (If only he had been thinking more clearly up until this point). Our Olivia’s return home seemed a little too easy, but that is my only minor complaint about the episode, although it was a shame that the alternate Boyles did not survive. While the arc for the first half of the season centered around Olivia, ultimately Walter is the key character in the war between the universes. The problem began when Walter took Peter from the other universe, but matters have been made much worse by Walternate’s overreaction and failure to see possibilities other than an attempt by our universe to destroy his universe. While Walternate sees the situation as coming down to only one universe surviving, it seems like this all could be easily resolved if the two Walters could only get together to explain their positions to each other and search for a mutually beneficial solution. If these two warped geniuses put their heads together I bet they could put an end to the disruptions in the other universe. 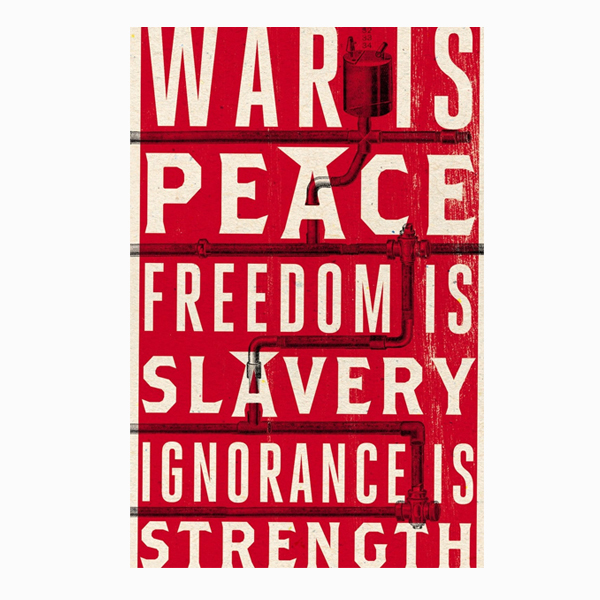 As we recently found out that those in the containment fields are actually in a form of suspended animation and not dead, the consequences of the “war” could even be minimized. Besides the big questions of the war, there’s also many questions regarding Olivia’s relations with coworkers. It appears possible that Peter might continue his romance with Fauxlivia with the real Olivia. On the other side, Fauxlivia has returned to the alternate Fringe unit, with her coworkers unaware she has been gone. Will she run into problems due to lacking knowledge of what happened when Olivia was there instead? More importantly, will her experiences on our side lead to her questioning Walternate’s version of the conflict? Just how explosive is tonight’s episode and is it at all accessible for new viewers who may be hesitant to jump on the bandwagon this far into the series? Jeff Pinkner: Actually if the only episode of FRINGE you ever tune into watch is this one — sure it’s going to take you five minutes to sort of catch up — but you will feel what’s going on. It’s a great entry point and you will understand the relationships. The truth is the one right afterwards, which is the falling out of this episode and sort of the picking up the pieces episode, is equally a great place to join both because it’s a reset episode. Olivia will be home and sort of like dealing with the consequences. It’s Rip Van Winkle dealing with the consequences of everything that she missed. Both of these episodes are actually a great place to join in. 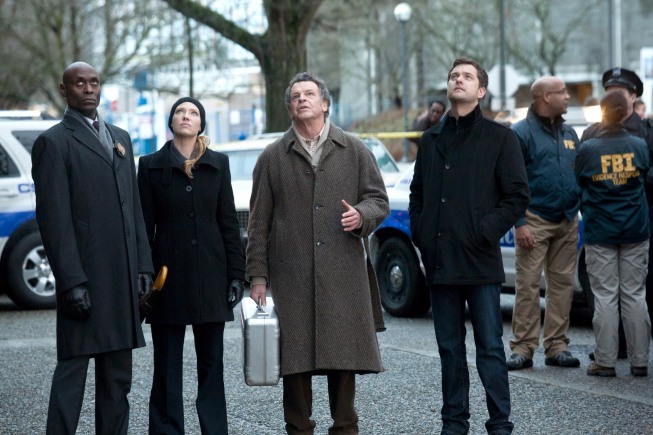 What can you tease about what’s in store for fans when FRINGE returns in January of 2011? J. Pinkner: Well the first half of the session was sort of like the condition of Olivia being trapped on the other side over there and Bolivia being among our characters. Now with this episode we’re sort of—the remainder of this season, I don’t know how much we want to spoil, but this episode sort of like brings the first half of the year to an end. Then the rest of the year will be the consequences and the fall out of what happened both emotionally and plot wise for all our characters. As we’ve said from the beginning, like we’re committed to telling stories over there and the first half of the season will dramatically change the conditions over there as well. Once Olivia returns to our side, the storytelling’s not just going to be contained on our side. J.H. Wyman: Yes, I mean we’re going to sort of like come to a crescendo using both sides. Would it be fair to say that questions, such as the endgame in terms of “the machine” will be answered? J.H. Wyman: We don’t want to drive things out and make people frustrated with what that machine is and what it means to the series and the characters themselves. By the end of the session you’re going to fully understand what that machine is and what it’s purpose is. What it’s for. Meaning for this universe and that universe and what it means to our characters. We definitely are going to have some sort of resolution. Dexter is down to two episodes. (Spoilers regarding tonight’s episode follow). We assume that he will ultimately kill Jordan, but what about Quinn, Liddy, and Lumen? We know that Dexter finds out he is under surveillance. It is doubtful Liddy will survive with his knowledge, and the big question is what happens to him as killing him would violate Dexter’s code. 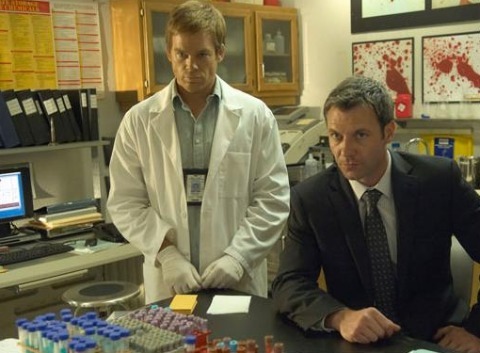 There are many possibilities but I would like to see Lumen take Liddy out to protect Dexter. Before that happens, clips from the show indicate that Dexter, tracking down the surveillance equipment, finds Quinn’s name on the requisition leading him to think that it is still Quinn who is spying on him. There’s also other indications that Quinn is in trouble. The biggest question is Lumen’s fate. In the past Dexter wound up killing those who got too close to him and knew his secret, but this season does not look like it will turn out that way. 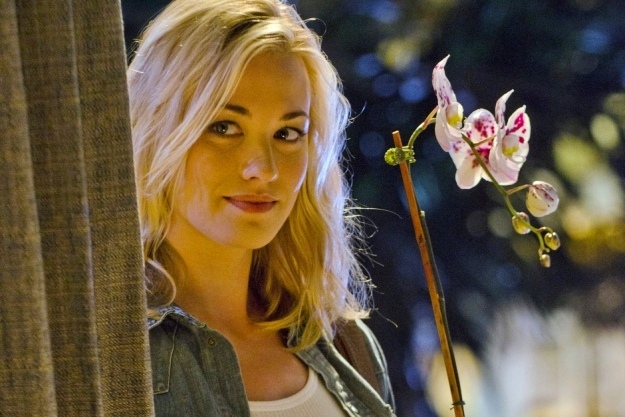 I can easily see her getting killed by Jordan Chase before Dexter gets to him, but would they really do that to Dexter after last year’s finale in which Trinity killed Rita? Perhaps Lumen will just return home, with Dexter feeling confident she would never betray him. Besides Lumen possibly surviving the season with this knowledge, there have been close calls in which Deb has come close to finding out more about her brother than she would probably like to know. Will she find out everything this season? 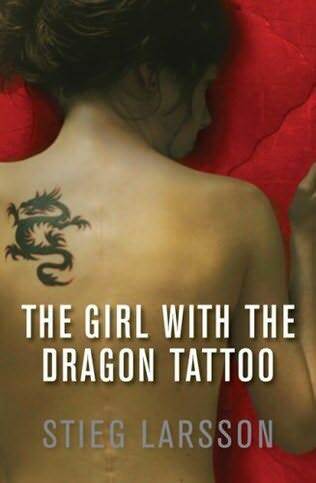 It is possible, as in the book series she did find out at the conclusion of the first novel, which was very similar to the first season of the show. They have even set up the possibility of Deb accepting this with her realization that a vigilante was tracking down the murderers and with her accepting that idea. The video shows it going far beyond just finding a communication device.